Want to getaway to the Napa Valley but don’t want to spend your return flight in a major Cabernet and rib eye coma? Then perhaps you should have a look at these hotel and winery wellness programs to keep you balanced throughout your stay. There’s nothing ascetic about these healthy offerings – try fitting in one or two classes a day before wine tasting or spend your whole day being active before a decadent dinner. 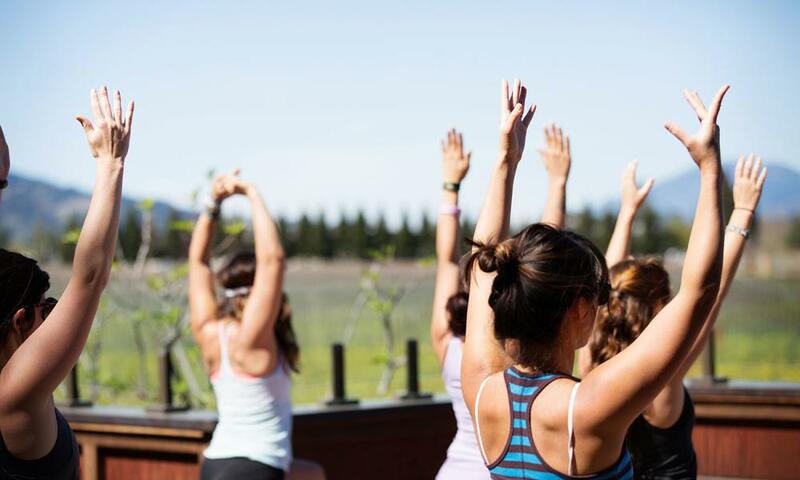 From hikes and bikes to yoga and Pilates – the Napa Valley has wellness a-plenty to keep your heart rate up and your mind/body connection renewed. Besides being a full-on country club style resort with bocce ball, tennis, a swimming pool, and golf – the Meadowood Napa Valley resort also offers indoor cycling, Pilates, yoga, personal trainers and even has guided hikes on their property. Solage offers guests daily complimentary fitness classes including yoga, TRX, Pilates, Spin, Aqua Aerobics and more. They also provide bicycles for exploring the area. If you aren’t staying at the resort, you can pay a small fee to attend these classes on their property. The hotel hosts weekly yoga classes at 6:00 p.m. and 7:15 p.m. on Mondays which is complimentary for guests and non-guests can pay to attend. Join Sullivan Wines for a one-hour outdoor yoga class on their beautiful terrace every Saturday at 9:30 a.m. followed by an hour-long wine tasting of three current releases. Invite your friends to join you and local yoga pros for group yoga class followed by a tour of the vineyard and plein air brunch paired with Domaine Carneros’ sparkling wines. (Requires group booking of 8-10 participants). Vineyard 29, open by appointment only, invites groups of 6-10 to book an outdoor private Pilates or barre class, followed by a winery tour, tasting, wine-paired lunch from local purveyors and souvenir bottle of wine.